You have added Southwestern Chic Belted Dress into shopping cart. We love the bold fabric and bright colors of this dress that has a subtle southwestern inspired style. 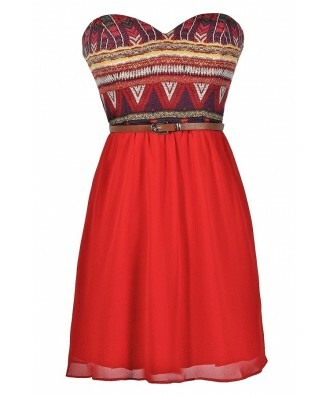 The Southwestern Chic Belted Dress has a strapless sweetheart neckline and lightly padded bust. 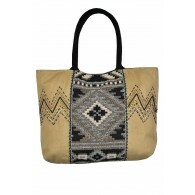 The top part is made of a printed fabric with an abstract geometric design. The empire waist gives way to the flowy bright red chiffon skirt. An included brown belt wraps around the waist of this dress and ties the whole look together. An exposed back zipper completes this dress. 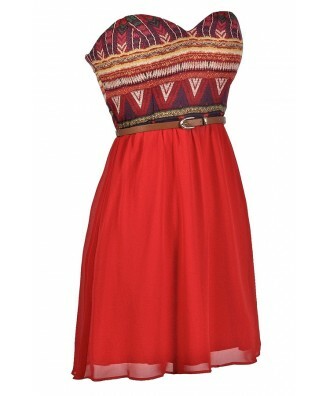 The Southwestern Chic Belted Dress would look nice paired with wedges or pumps. You can dress it down with flat beaded sandals and an oversized bag. 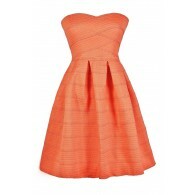 Another option is to pair this dress with brown cowboy boots to match the belt. This is a fun and unique summer style. Details: Fully lined. Lightly padded bust. Belt included. Exposed back zipper. 100% polyester. Remove belt. Machine wash cold. Do not bleach. Line dry. Cool iron as needed. Size 3 measurements: Length from top of bust to hemline: 28". Bust: 30". 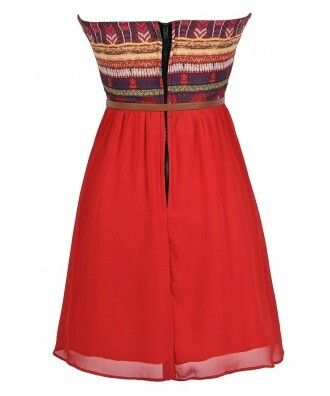 You have added Southwestern Chic Belted Dress into Wishlist. You have added Southwestern Chic Belted Dress for Stock Notification. You have set Southwestern Chic Belted Dress as a loved product. You have removed Southwestern Chic Belted Dress as a loved product.